With my favorite holiday right around the corner, I just had to share with you a quick and easy idea for making these super cute Christmas Tree ornaments. Every year I try to make ornaments for friends and family (and myself), to mark the years. I’ve been doing this since I was about six years old; hopefully the quality of my work has improved slightly since then! When I was young, we had a mother/daughter gift exchange and would each make a special ornament to give each other. It’s one of my fondest memories and I still have every one! For these ornaments I grabbed a few simple supplies and have provided instructions below, but as always, use your own creative ideas and feel free to use what you may have on hand. Maybe you can start a tradition of making different ornaments for yourself or friends and family to mark the years as they go by! For a quick how-to video demonstration, click the white triangle "play" button in the center of the image below. 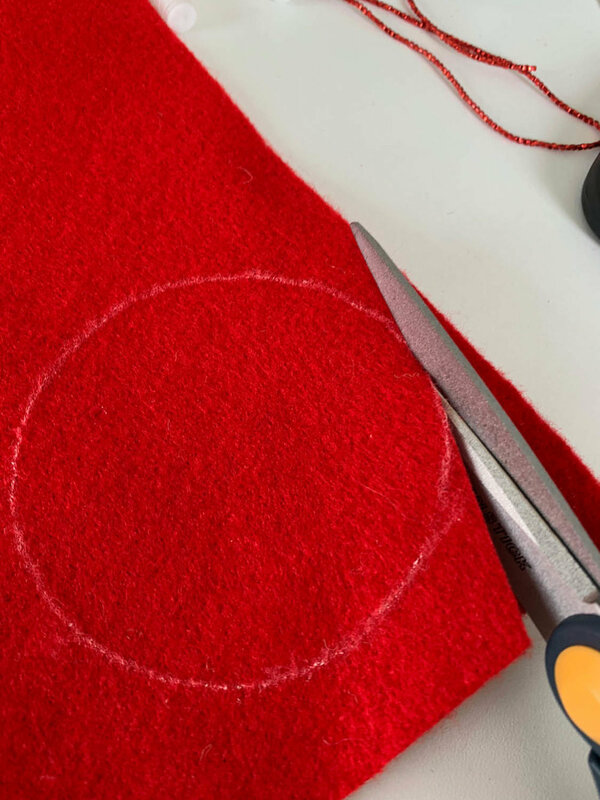 Using your template, trace a circle on your fabric with a fabric marker. Cut two of these circles. Lay out your embellishments and experiment with the design for your desired ornament. For lace or ribbon (like I used) cut a length about 1” longer than the width of your circle; you’ll be tucking the ends inside the ornament for a clean look. Using one of your fabric circles and a needle and thread, stitch down embellishments (lace/ribbon/buttons/beads) for the front side of your ornament. Leave 1/2” of lace or ribbon on each end to tuck into ornament. For my ornament I used a silver cross charm that hangs at the bottom center. This is the best time to stitch this in place too. Begin stitching circles of ornament together using a blanket stitch (or other stitch of your choosing) and embroidery thread in color of your choice. When you’ve stitched about 3/4 of the way around your ornament, stuff your circle loosely with fiber fill. Continue stitching till you’re almost completed. To make a hanger for your ornament, cut a length of thread or ribbon about 6” long, fold in half and tuck the ends into the top of the ornament. (If using embroidery thread for the hanger, knot the ends before tucking them into the ornament.) Stitch the remainder of the way around your ornament, firmly stitching down the hanger. Use these cute ornaments for your own Christmas tree or as a special gift! Experiment with different colors, textures and embellishments. I’d love for you to share your own unique designs with me and I will feature as many as I can on this website. This is a crafting community and my hope is to inspire you to try my ideas, but also use your own creative expression to create wonderful handcrafted treasures!